Save the date for the 3rd annual Orange Gala! This year's theme "In Bloom" says it all! 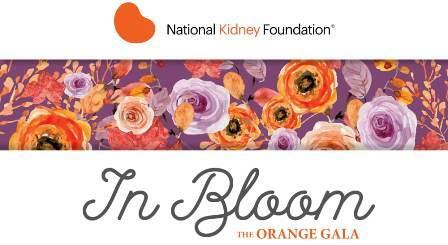 We will be celebrating the lives of those impacted by kidney disease and the new life that is possible thanks to kidney donation. The evening will feature fine-dining, exciting entertainment, and unique engagement opportunities. You won't want to miss this remarkable evening! Complimentary Parking provided at 6th street parking garage. Please look for the NKF logo, an attendent will guide you into the parking ramp. From there you will take the elevator to the 6th floor. Sponsorships make this event possible. For information on how your buisness can support our efforts, click here for Sponsorship Opportunities. We are always looking for more local expierences and items to add to our auction. Contact Carly, carly.hodes@kidney.org, 651-636-7300 for donation opportunities. Have an eye for centerpieces or a knack for details? Join our event Planning Committee, we would love to have you! In Minnesota alone there are 400,000 people living with CKD, 2,000 of them are currently on the waiting list for a transplant. In 2017, your local NKF office accomplished a great many things- From helping introduce the CKD Early Detection Bill to Congress, to developing partnerships with local grocery chains to develop renal-friendly shopping guides, and finally, spreading awareness to over 1,300 people about CKD & NKF through local outreach events. With your support, imagine all we can accomplish in the years to come!